Are These Ducks Ready to Fly? With a tentative deal being reached on a new ten-year collective bargaining agreement between the NHL and the NHLPA, HOCKEY IS BACK Y’ALL! At least, that is to say, NHL hockey is back. I, for one, spent plenty of time during the lockout (sorry….work stoppage) watching ECHL games, Division 1 college games on TV, local college teams like USC and Loyola Marymount University live and in person, and of course, I played plenty of hockey, too. But now it’s time to turn our collective eyes to the however-many-game (48 or 50) NHL season that we’ll drop the puck on in less than two weeks time, and specifically, how the Anaheim Ducks are constructed and perhaps what to expect one the puck does indeed finally drop. Overview – Have the Ducks Done Enough to Compete? When the 2011-12 NHL Regular Season came to a close, the Anaheim Ducks found themselves sitting in 13th place in the Western Conference with a measly 80 points on the campaign – a campaign that, remember, saw the firing of long-time head coach Randy Carlyle and the hiring of Bruce Boudreau. With a new (perhaps more positive) voice behind the bench, Anaheim caught fire, going 9-2-1 in January and a 27-23-8 overall record under Boudreau (a wins-loss record significantly affected by a 3-10 December record). Indeed, Anaheim was one of the hottest club in the League over the last half of the season, and many pundits believed that they may just squeak back into a playoff spot. It was not to be, however, as the Ducks simply ran out of gas before the finish line and sank back down to 13th overall in the West. Here’s the good news: where Carlyle’s teams have notoriously slow starts, Boudreau’s squads seem to jump out of the gate at a sprint, and in a shortened season, a quick, hot start really can make the difference between making the playoffs or not. Here’s the bad news: the question as to whether Anaheim General Manager Bob Murray did enough over the off-season to buoy a thin roster, is very much up for debate. The Ducks, in theory, boast one of the most lethal top lines in the world in Bobby Ryan, Ryan Getzlaf, and Corey Perry. That is, in theory. Anaheim’s top trio has consistently had some rather major consistency issues. Bobby Ryan is a notoriously streaky player, Getzlaf seems to be trending down, and Perry, while a gamer to be sure, can’t carry the load all by himself (his 2010-11 MVP campaign notwithstanding). Elder statesmen Teemu Selanne is still one of the most dangerous snipers in the game, but he’s also 42-years-old, and as painful as it is to admit, he will start to slow down at some point. He cannot be relied upon to provide the bulk of an offensive attack, and nor should he be. Saku Koivu is still an incredibly useful player, but it seems as though his days as a legitimate second line center are behind him. And Andrew Cogliano is as streaky as he is fast. The rest of the offense is spread out between off-season signing Daniel Winnik (a good checking line center), tough guy Brad Staubitz, and young players Kyle Palmieri, Brandon McMillan, Devante Smith-Pelly, Matt Beleskey, and Nick Bonino. Hardly a group that strikes fear in the hearts of men. It is worth nothing that 2009 first round draft pick Peter Holland is leading Anaheim’s AHL affiliate Norfolk Admirals in points with 29 in 32 games, but he’s also got a -9 rating, and likely needs a little bit more seasoning. Big power forward Patrick Maroon has also played well in Norfolk, with 21 points in 32 games while wearing an A on his sweater. Does Maroon have what it takes to translate his game to the show? 2010 draftees Devante Smith-Pelly (who stuck with the big club in 2011-12) and Emerson Etem (who tore up the WHL to the tune of 61 goals and 107 points) have 13 and 10 points respectively, with Smith-Pelly sporting a tied-for-team-worst -14 rating. If the Getzlaf-Perry-Ryan line is slow to start, or inconsistent, and if Teemu Selanne begins acting like anything resembling his age, do the Ducks have enough offensive support waiting in the wings to make it through? I tend to think not. The Ducks have seven defenseman under contract for the 2013 season, with off-season signing Sheldon Souray and third year man Cam Fowler expected to carry the load offensively with Francois Beauchemin, Bryan Allen, Toni Lydman, and Luca Sbisa playing rhythm. Nate Guenin is slotted to be the seventh defenseman. On paper, that’s not a terrible defensive line-up, especially with the addition of Allen, a big stay-at-home defenseman with a mean streak – but where have Anaheim fans heard that before (coughAndySuttoncough)? The Souray signing was a real head scratcher, though. Bob Murray signed the 36-year-old injury prone rear guard to a three-year deal worth $11M. While Souray had a decent (albeit injury-shortened) season in Dallas in 2011-12 with six goals and fifteen assists in 64 games, the fact is that he’s on the wrong side of 30, and has been trending down for the last several years. Cam Fowler is another year older, and hopefully another year better defensively. While the sophomore played a full 82-game schedule in 2011-12, with bigger minutes against stiffer competition, he finished the season with five goals and 24 assists, or eleven fewer points than his rookie campaign. He also ended the season with a -28 rating, compared to a -25 the season before. Beauchemin figures to be a rock defensively, while Toni Lydman struggled last season and will hope to regain his stellar 2010-11 form. The interesting variable here is Luca Sbisa who had a decent 2011-12 season with 24 points (5G, 19A). Specifically, according to Bruce Boudreau, Sbisa may well have been Anaheim’s best defenseman down the stretch in 2011-12. Boudreau even went so far as to peg Sbisa as “a silent star in the making.” High praise, indeed. Undersized Sami Vatanen may also challenge for a spot, having played very well in Norfolk (4G, 17A – good for 4th on the team). Ditto 2012 5th Overall pick Hampus Lindholm, although he is currently concussed. If Sbisa can continue his development into that “silent star,” Fowler can take a step forward, Souray puts some points on the board and stays healthy, and if Allen, Beauchemin and Lydman can minimize offensive threats in their own zone, Anaheim may have an alright blue line in 2013. Jonas Hiller is still the man between the pipes for Anaheim for the foreseeable future. Hiller was a workhorse in 2011-12, playing 73 games and posting a 2.57 GAA and a .909 SV%, behind a shaky defense. Often Hiller had to stand on his head to even give his teammates a chance at winning, and they often let him down. His strange vertigo-like symptoms seemingly behind him, he’s one of the best goaltenders in the League, and this is the one area where Anaheim shouldn’t have much to worry about. Jeff Deslaurier is a respectable back-up, although free agent signing Fredrick Anderson, who has been playing well for Norfolk (2.46 GAA and .924 SV%), figures to challenge for the back-up job in an abbreviated training camp. There is still much uncertainty surrounding these Anaheim Ducks. Can Getzlaf-Perry-Ryan live up to their billing (and consistently)? 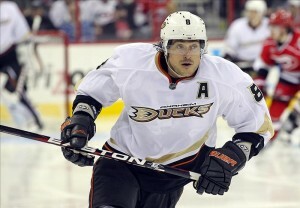 Will Teemu Selanne continue to drink from the fountain of youth? Will the young Fowler and Sbisa take major steps forward in their development as top flight NHL defensemen? Can Sheldon Souray stay healthy and contribute at both ends of the ice? How will the young guys (Etem, Smith-Pelly, Holland, Palmieri, Vatanen and Lindholm) fare? The Ducks had comparatively few players leave North America to play over seas – will that positively or negatively affect sharpness, timing, fitness, and energy levels? Can Bruce Boudreau inspire this team to a hot start and ride that to a playoff berth? Honesty being the best policy, I say no. This roster is just too thin, too top-heavy, as currently constructed to do real damage. They should do better than last season, but I don’t see this incarnation of the Anaheim Ducks finishing in the Top 8 in the Western Conference.